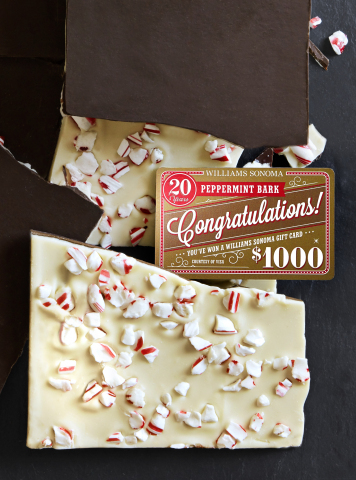 Williams Sonoma, a member of the Williams-Sonoma, Inc. (NYSE:WSM) portfolio of brands, announced the launch of the "A Chance to Win in Every Tin" campaign to celebrate the 20th anniversary of the brand's iconic holiday treat, Peppermint Bark. Together with Visa, Williams Sonoma has hidden over 1,500 winning golden gift cards inside the signature Peppermint Bark tins. Available both in stores and online at www.williamssonoma.com, customers who purchase a tin have a chance to win one of the golden Williams Sonoma gift cards that range in value from $20 to the grand prize of $1,000. Customers that win a golden gift card are encouraged to share with Williams Sonoma on Instagram using the hashtag #barkyeah and tagging @williamssonoma. The Williams Sonoma nostalgic Peppermint Bark candy is often copied but never matched in quality or flavor. The once-a-year favorite is handcrafted in San Francisco using the finest ingredients, including custom-blended Guittard chocolate and triple-distilled oil of peppermint. Master candy makers pour a layer of melted dark chocolate on a marble table and then top it with a layer of creamy white chocolate. This "bark" is finished with a snowfall of handmade peppermint candy pieces. The result is an unforgettable holiday confection with a perfect harmony of flavors and textures in every bite that is only available at Williams Sonoma for a limited time each year. The original Peppermint Bark recipe was developed and approved after more than twenty rounds of testing in 1998. The Peppermint Bark name was inspired by Williams Sonoma founder Chuck Williams' love of dark and white chocolate and his famous affection for dogs. Since the product first made its debut 20 years ago the packaging has always included the now iconic Peppermint Bark Dalmatian. Each year over 1 million pounds of Guittard chocolate and 65,000 pounds of peppermint bits are used to create Williams Sonoma's famous Peppermint Bark. The Williams Sonoma store at Columbus Circle, will also host a special Peppermint Bark Bake Off event on November 29th in partnership with Bake From Scratch Magazine and three influential baking bloggers. Erin Clarkson of @cloudykitchen, Vallery Lomas of @foodieinnewyork, and Erin McDowell of @emcdowell will compete to see whose Peppermint Bark creation will be the favorite recipe of a panel of celebrity judges which will include Amirah Kassem of Flour Shop and Brian Hart Hoffman, editor-in-chief of Bake From Scratch. Tickets are $15 and include a copy of Bake from Scratch Magazine and a donation to St. Jude Children's Research Hospital: https://williamssonoma-peppermintbark-bakeoff.eventbrite.com. Since its founding by Chuck Williams in 1956, the Williams Sonoma brand has been bringing people together around food. A member of Williams-Sonoma, Inc. (NYSE:WSM) portfolio of brands, Williams Sonoma is a leading specialty retailer of high-quality products for the kitchen and home, providing world-class service and an engaging customer experience. Products include cookware, cooks' tools, cutlery, electrics, bakeware, food, tabletop and bar, outdoor, cookbooks, as well as furniture, lighting and decorative accessories. Each store offers cooking classes and tastings conducted by expert culinary staff. A comprehensive gift registry program for weddings and other special events is available in stores and online. On williams-sonoma.com and the Williams Sonoma blog, Taste, customers can find recipes, tips, and techniques that help them create delicious meals and wonderful memories. Williams Sonoma is also part of an active community on Facebook, Instagram, Twitter, Pinterest, Google+ and YouTube.